I know a “nothing burger” when I see one. Something that is lame, a dead-end, or doesn’t live up to the hype is easy to figure out sometimes. And how do you figure it out? Simple. Do some homework. 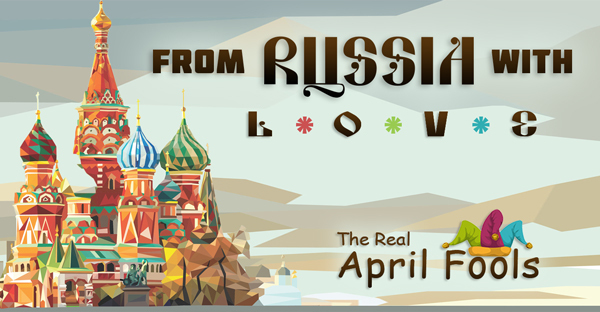 The American public has been told for over two years now that its current President, Donald Trump, colluded with the Russians before and after the start of his Presidency. When this “Russia Collusion” nonsense was first perpetrated, I had one simple question: What is the evidence—not speculation, but evidence? Gathering facts is how we are supposed to figure out things in this lifetime. Someone critiqued me last week for using facts logically in an argument I was making. I thought it was kind of funny since that is how you are supposed to make an argument! I have been amazed by the number of people I’ve chatted with who believe the Trump Campaign colluded with the Russians. I’ve asked them just one simple question: “What evidence do you have to back up that position?” And, of course, they never had any. That is the point. We are living in a world of opinions now and not facts. Some of the polling data (Don’t trust polls by the way!) said that over 50 percent of Americans believed the Russians were colluding with Mr. Trump. The real question is: How could so many people fall so easily for this obvious lie? There really is an easy answer: the Father of Lies is rather busy at the moment. Look at the media’s history over the last five or so years . . . 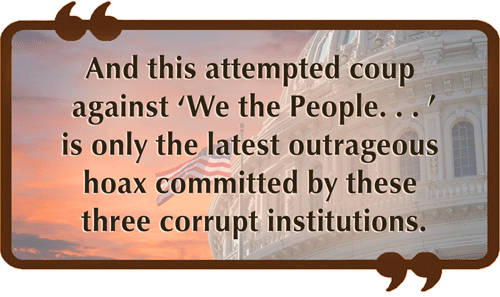 The list of how we have been misled and lied to through the years just goes on and on. Could there be another reason why all of this keeps happening? Do you know what that statement means? It means we should literally be questioning EVERYTHING that comes across our airwaves, is posted on websites, or is published in the books we read. EVERYTHING. Have you heard about Operation Mockingbird? “For those unfamiliar, Operation Mockingbird was a CIA operation, which began as the Cold War ramped up in the 1950s. In an attempt to gather intelligence and influence public opinion, the CIA recruited journalists from across the United States. 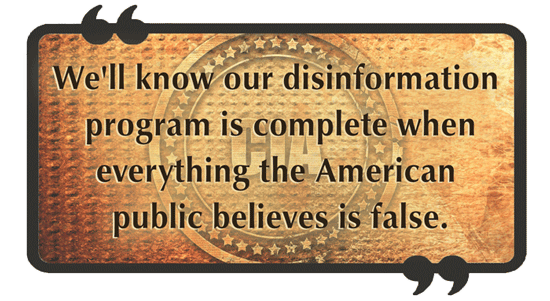 There has been a long-term strategy by many to deceive the public. I guess they think we can’t handle the truth. But that’s not really their motive. They want us to think a certain way. So they put news out in the way they want and spin it the way they want, hoping the non-thinking public will go right along with it. Christians are supposed to be thinkers and studiers. We are not to be so easily deceived. But if we are not building our knowledge base, we can be led away by the lies of Satan, just like anyone else. 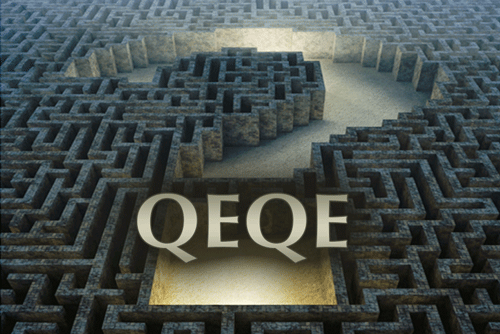 Remember that one of things we have taught in this ministry for years is QEQE: Question Everything and Question Everybody. For instance, think about the question of macroevolution, which says that mankind evolved from a completely different species. Now, many of us were taught this theory in public school. However, once you question it and look for the facts, you see how easy it is to come to the conclusion that God created us and we didn’t evolve. But you had to question it first to get to the right answer. Isn’t it interesting that one thing you must believe in to be tenured at a university in the Sciences is macroevolution, which is so easily debunked? Shouldn’t that make us want to question everything science has been teaching us? They also told us margarine is better for us than butter. It was not. They told us get out of the sun and use sunscreen. Now they are finding out that chemicals in sunscreen are horrible for the human body, and the best source of Vitamin D we can get is from sunlight on our skin!! As I was putting this newsletter together, I saw this article: “Duke University to Pay over $100 Million in Settlement for Fake Research.” Yes, scientists do lie. So what does this mean? It means we should question everything that science is telling us. We should question the plane earth vs. the globe earth. We should question geocentricity vs. heliocentricity. We should question man-made global warming vs. normal, cyclical temperature changes that our earth experiences. Should Christians Trust the Media? We literally don’t question anything anymore. We just follow whatever we are told. For instance, I ask people if they think Michael Jackson was a child molester. I only get one answer: “Yes.” I ask why they believe that is true. Typically, they do not have a lot of evidence. Did you know there is evidence to the contrary? The current HBO film about this allegation documents two men who said Jackson molested them, yet these men have publicly stated he did not molest them! They have even given testimony under the penalty of perjury that he did not molest them. In the trial, Jackson was found not guilty on all ten counts. Were the witnesses right or were they wrong? Was the jury right or were they wrong? The two young men closest to Jackson, Emmanuel Lewis and Macaulay Culkin, said absolutely nothing happened to them. He never abused them. Is it possible that Michael might have just preferred the innocence of children to the nonsense of adults? If you study his upbringing, it might just be a possibility. Now, let’s be honest here. Something isn’t right when a man of Michael Jackson’s age is hanging out with so many young people who are not his children or relatives. And, by the way, where were the parents of those kids? But does this add up to molestation? Why don’t we question things anymore instead of believing whatever the news media tells us? Have you ever questioned if O. J. Simpson killed Nicole Brown Simpson? Everyone I ask says they are sure he did it. But did you know there are other theories out there about who might have perpetrated the crime besides O. J.? 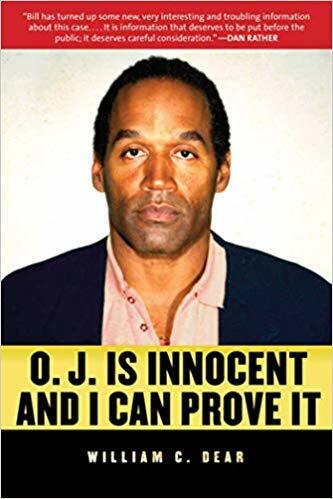 Did you know that private investigator William Dear, who was inducted into the Police Officers Hall of Fame, has written an entire book about the O. J. Simpson case? Now, I am not sure who killed Nicole Brown Simpson. But why don’t we even question things anymore? When I ask people about Michael or O. J., I get a lot of opinions. But how about facts? What are the facts that you will stake your claim on in any situation? So what else is the media trying to get us to believe? The media is not your friend. They are trying to be your master. They are trying to make you the puppet. Isn’t it time to cut those strings and think for yourself? What else is Satan trying to get us to believe? He is trying to turn Christians against the most pro-life and pro-Israel President this nation has ever seen. Satan is trying to make you trust science more than God’s Word. Satan also wants to keep you uninformed about proper health and how to take care of God’s temple. So what can we bank upon? What is going to be a solid foundation for us? We are spending way too much of our time trusting in bad sources. We are not testing things like we should. Satan will do a lot more lying in the days to come. What would be a good strategy for you to be prepared with in every situation? QUESTION EVERYTHING and QUESTION EVERYBODY! !